We’d love your help. Let us know what’s wrong with this preview of The Strawberry Thief by Joanne Harris. Bu The compelling new novel from the author of the bestselling Chocolat. To ask other readers questions about The Strawberry Thief, please sign up. Is this date for only U.K. Publication? When will it be available in U.S.? Joanne Harris It should be out in June, 2019. Could you read this book without reading the others? I've read Chocolat but wondered whether this might be a good choice for my book club. Joanne Harris takes the reader back to Lansquenet-sous-Tannes, and the now accepted chocolatier, Vianne Rocher, continuing to practice her own brand of chocolate magic. How things have changed, even Francis Reynaud, the priest, once her fiercest critic is now a friend. Vianne has lost her summer child, Anouk, to Paris and the man she has fallen in love with. She finds some comfort that her winter child, the special Rosette will never leave her. Rosette doesn't attend school, does not speak, has Joanne Harris takes the reader back to Lansquenet-sous-Tannes, and the now accepted chocolatier, Vianne Rocher, continuing to practice her own brand of chocolate magic. How things have changed, even Francis Reynaud, the priest, once her fiercest critic is now a friend. Vianne has lost her summer child, Anouk, to Paris and the man she has fallen in love with. She finds some comfort that her winter child, the special Rosette will never leave her. Rosette doesn't attend school, does not speak, has a companion that only few can see, Bam, the monkey, and has a special gift for art and drawing. Snow makes an unexpected appearance, and the winds of change are blowing, heralding death, unstoppable chaos and a confrontation between different forms of powerful magic, that of chocolate and ink. Vianne has a desperate sense of foreboding, the tarot cards, Death, The Fool and The Tower, promise a future that is to test and challenge her. The death of Narcisse, the florist, triggers conflict and the entry of a newcomer with no feet taking over his shop premises. The mysterious Morgane and her reception by the village carries uncanny echoes of Vianne's experiences on first settling in the village. Whilst many do not get Rosette and belittle her, Narcisse becomes close to the child after catching her stealing strawberries. He bequeaths his wood to Rosette, the strawberry thief, to be held in trust for her until she is of age. Whilst Rosette is overjoyed, Narcisse's daughter is less than happy, looking for ways to challenge the bequest. Narcisse had rejected the church and was not fond of Reynaud, but he leaves behind a confession for Reynaud that tells of his heartbreaking background and history, particularly his close relationship with his beloved sister, Mimi, afflicted with seizures. Reynaud carries a heavy burden of guilt from his actions as a child that had such tragic outcomes, events he has never dared to speak of, which he is certain will see him roundly condemned by all. He is afraid that Narcisse knew of his secret. Morgane appears to wield a power over the community and Rosette that makes Vianne so afraid that she will do anything to make her leave. Joanne Harris is an enchantress with words. She never fails to enchant me and whenever I finish her wonderful books it is with a deep sign of regret that the book is finished but also with satisfaction that for several hours I have been immersed in a magical world. This is the fourth book in the Chocolat series and every bit as good as it’s predecessors. Some of the characters are old friends who make you feel like you’re donning a favourite pair of old comfortable shoes - perhaps lollipop shoes Joanne Harris is an enchantress with words. She never fails to enchant me and whenever I finish her wonderful books it is with a deep sign of regret that the book is finished but also with satisfaction that for several hours I have been immersed in a magical world. This is the fourth book in the Chocolat series and every bit as good as it’s predecessors. Some of the characters are old friends who make you feel like you’re donning a favourite pair of old comfortable shoes - perhaps lollipop shoes??!! (I know, I know. Zozie wore those so definitely not friendly shoes!) There are some new characters who whilst not all likeable they help to create a story where a lot of issues from previous books are resolved. For example, we learn much more about Reynaud and the truth of his story. I can’t help liking him as I think he’s ultimately honest and there is kindness in him. The story centres around the death of Narcisse who leaves most of his property to his odious daughter Michele Montour but a patch of wood to Rosette, Vainne’s daughter. Rosette is the strawberry thief in the story although this image also appears in the tattoo parlour of Margane Dubois. Narcisse leaves a file to Reynaud which tells the story of his life. That is fascinating although not always an easy story. There’s the usual magic here too, Vianne, the wind, Rosette and Margane in their own unique ways contribute to this. As well as the story of Narcisse another theme is Vianne’s unease which is summed up by this quote ‘Sometimes children fly away. We do what we can to keep them’. Rosette makes a number of life changing discoveries as does Vianne which revealed that she need not be afraid of her girls moving on and that all the upheaval in the story characterised by the wind was caused by Vianne herself. The book finished on a lovely optimistic note. I really hope there’s a 5th in this series as I’d love to see what happens to Rosette and to Anouk and Jean Loup in the future as well as where Vianne’s story goes now she has released her girls into the world. Many ardent fans of Harris's have been awaiting a new novel from her for quite some time and what a spellbinding read it is. We return to Lansquenet-sous-Tannes to visit protagonist Vianne who has eventually settled in the area. The writing is lyrical and mesmerising and you can't seem to put it down come hell or high water, even when there are chores you need to tend to. The descriptions of the chocolate-making process and the local scenery are beautiful and so vivid you can smell, see, taste a Many ardent fans of Harris's have been awaiting a new novel from her for quite some time and what a spellbinding read it is. We return to Lansquenet-sous-Tannes to visit protagonist Vianne who has eventually settled in the area. The writing is lyrical and mesmerising and you can't seem to put it down come hell or high water, even when there are chores you need to tend to. The descriptions of the chocolate-making process and the local scenery are beautiful and so vivid you can smell, see, taste and hear the surroundings. The character development is superb as ever, with Harris using folklore and legend to infuse her story with an enchanted magic that is rare and special. Despite being the fourth long-awaited novel in the Chocolat series it is certainly not essential to have read its predecessors in order to enjoy it, as there is plenty of background provided to ensure new readers are filled in. You are pulled into a world so rich in beauty and emotion that tearing yourself away is simply not an option; this is a story with multiple threads masterfully woven together by a storyteller of unimaginable ability. It's an altogether charming tale with a surprising gothic tinge to it. The slow unravelling of village secrets keeps the reader engaged and the ending was a very poignant and emotional conclusion to a brilliant series. This is a bewitching read that will appeal to long-term Chocolat fans, dark fairytale aficionados and lovers of beautifully told whimsical stories. 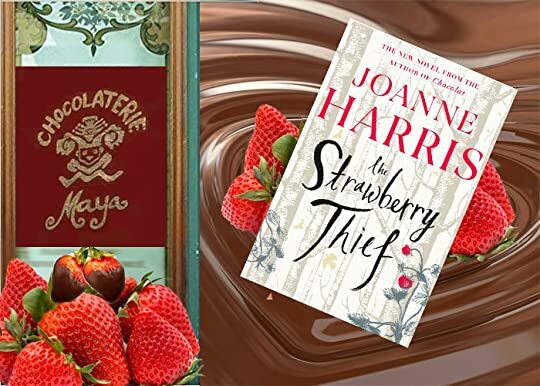 What more is there to love than a book by the wonderful writer Joanne Harris, Chocolat and Strawberries! Take all three ingredients, add a dash of Harris magic and you have the wonderful new novel The Strawberry Thief. It's always a treat to revisit a magical place found in a book, even if fictional. Lansquenet-sous-Tannes sounds so real and in a way, I believe it is - it's so well brought to life, evoked in flavour and tastes, that you will honestly feel you are there. It's a lovely feeling wandering back into Vianne's world. Things have changed! There's not the hostility she found in Chocolat (maybe all that sweetness and chocolate has mellowed them all) but the olde worlde charm is even more heartwarming. There's wild strawberries throughout the novel as a theme and one shop even has it on their wallpaper. Not only that - if sniffing the pages of the book is not enough for you, and you can't get enough strawberries and chocolate to eat as you read, there's now a perfume to accompany it and make the reading experience even more magical! Vianne's chocolate shop is still as delectable as ever and chocolate fans will rejoice at living and working in the shop again. with one daughter off in Paris, Rosette is the daughter with special abilities such as the way in which she sees the aura of those who live in the village. She has speech problems but she can communicate with feelings, emotions and in many more spiritual ways. Then there's the priest Reynaud - he's totally different and it was a pleasure to meet him again and get to know the person behind the shell. He now finds himself in the middle of the chaos when Vianne is left the land, the florist's family believe should have been theirs. Is the peace of this village now threatened? Aah but this isn't just a case of Vianne and the villagers. No, there's added tension as there's a newcomer, just like Vianne was all those years ago. Morgane takes over the florist shop but she's not exactly welcome by the others. You might think Vianne would see herself in her...and maybe she does. I got the feeling that somehow Vianne now realises the threat the villagers once saw in her. Morgane is as unique and as quirky as she was, and still is. Thisgave an extra depth to the story and really got under the skin of the ' then and now'. I really enjoyed this novel as it was like going back in time - it's been twenty whole years since that Chocolat shop opened its doors! You know the fear of going back to a place you've loved and been so happy in and it no living up to expectations and memories? Well, that's not the case here - the village and the surrounding area, the people, the chocolate and the magic in the air is all there welcoming the reader from the very first page to the last. It took me back to the world of smells, flavours and colours. It made me listen to the wind. Going back to Vianne’s world was like visiting old friends. Joanne Harris is one of my favourite writers. The way she’s telling the story is multidimensional, you can smell it, feel it on your skin, see it. I read almost everything she writes. She never disappoints. The Strawberry Thief is the highly anticipated sequel to Chocolat which doesn’t disappoint. The cover for this book is absolutely beautiful and the picture above doesn’t do it justice. It’s got some lovely gold detail on the cover and the effect is stunning! It was great to revisit the village of Lansquenet-sous-Tannes to see what had changed over the years. The reader is also introduced to Rosette a special little girl who doesn’t talk and has an imaginary monkey, called bam as her best friend. The Strawberry Thief is the highly anticipated sequel to Chocolat which doesn’t disappoint. The cover for this book is absolutely beautiful and the picture above doesn’t do it justice. It’s got some lovely gold detail on the cover and the effect is stunning! It was great to revisit the village of Lansquenet-sous-Tannes to see what had changed over the years. The reader is also introduced to Rosette a special little girl who doesn’t talk and has an imaginary monkey, called bam as her best friend. She was instantly my favourite character in the book and I so enjoyed learning more about her as she never failed to make me smile! The wonderful relationship she developed with Narcisse was beautiful and it brought tears to my eyes reading about it. The story of the villagers is intertwined by dark local folk or fairy stories which were fantastic to read more about. I felt they added a slightly mystical element to the story which made the story more intriguing to read about and I felt added something to Rosette who especially seemed to believe them. This is a very absorbing story that is very easy to lose yourself in. The descriptions of the village are very vivid and I felt that I could picture it perfectly in my mind almost like I was there myself. I really enjoyed going on a journey with the characters and learning more of their secrets. The new shop adds an interesting slant to the story which I felt particularly fascinating though sad to see the village hadn’t learnt their lesson! I can’t believe it is twenty years since I spent a day in the garden reading the wonderful and charming Chocolat. Since then we have had the sequel The Lollipop Shoes and now the exciting third book The Strawberry Thief. Vianne is back in Lansquenet-sous Tannes running her chocolate shop with her daughter Rosette, now sixteen, whilst Anouk is living in Paris. After the death of local Narcisse, who leaves Rosette his wood, trouble comes to the small town in the form of his family and a new threat I can’t believe it is twenty years since I spent a day in the garden reading the wonderful and charming Chocolat. Since then we have had the sequel The Lollipop Shoes and now the exciting third book The Strawberry Thief. Vianne is back in Lansquenet-sous Tannes running her chocolate shop with her daughter Rosette, now sixteen, whilst Anouk is living in Paris. After the death of local Narcisse, who leaves Rosette his wood, trouble comes to the small town in the form of his family and a new threat to Vianne blows in on the wind. The book is set during the month of March and narrated by Vianne, Rosette, and Le Curé Reynard, and has excerpts from a letter to Reynard that tells Narcisse’s life story. It was exciting to be back in Lansquenet and catching up with old characters and meeting new ones. The surprise of this book is that Reynard and Vianne are now friends, he has mellowed over the years and is not as strict on himself. Roux and the river people are still at Les Marauds, Caro Clairmont is still gossiping and Josephine has her cafe; it was like meeting up with old friends. There were also some memorable new characters in Michélè Montour, Narcisse’s horrible daughter, her husband Michel and son Yannick, who I felt very sorry for. The wind blows in the mysterious Morgane Dubois who rents Narcisse’s old shop, and who Vianne sees as a threat to the harmony of her life with Rosette and the community. Rosette is my favourite character, she has the wonderful innocence of children but understands more than people give her credit for. Many feel sorry for her, and Vianne, due to her difference and individuality, but she has such a wonderful outlook on life and has her mother’s gift for the understanding of the wind and is at one with nature; and of course she has Bam for company. Joanne Harris vividly brings these characters, and their quirks to life, making them jump off the page and into your heart. Joanne Harris’s writing is remarkable, her observations and witty one liners bring the quirks of town life, the petty squabbles and allegiances to life and reminded me why I am such a huge fan of her writing. The attention to detail of the landscape, Rosette’s wood and the boats on the river are a picture postcard in my mind. In contrast to the beautiful setting there is a tale of murder, cruelty, the mother daughter bond and family feuds, that ripple through the quiet and quaint Lansquenet, bringing the wind of change to all. The Strawberry Thief is a charming, bewitching and simply stunning read. It lived up to all my expectations, and left me feeling fuzzy and warm and incredibly happy; what more could you ask for in a book. I immediately felt familiar with the characters, and the plot had me engaged from the first with a murder mystery and the wind blowing in Morgane to add a bit of trouble to the community. This is a must read for fans of Chocolat, an absolutely fabulous read. I was given a copy of this story in order to take part in the Blog Tour. My review and thoughts are a true and honest reflection of what I thought. I gave this a 4/5 stars or 8/10. In this story we once again return to Lansquenet-sous-Tannes and meet some familiar characters, that we originally met in Chocolat and also some new characters. Vianne Rocher is well settled in the community and along with her daughter Rosette, she still runs the chocolate shop which is at the heart of the community. Vianne enjoys being an integral part of the community, friend and confidant to many. Her youngest daughter Rosette, has a few problems and appears to be rather immature for her age, but she understands far more than people think she does. The story is riddled with secrets, that are slowly revealed to the reader that keep you engaged as the story progresses. Why has Narcisse left a parcel of land to Rosette in his will? This is only one of many questions that need to be answered and all will be revealed in due course. At times this is a slightly gothic read with dark undertones and at other it's a touch magical. Well written this story will engage the reader and transport you into the lives of the characters and the community that they live in. I’m afraid this wasn’t for me. I recognise that it’s a matter of taste and not that it’s a bad book, but I really couldn’t get on with The Strawberry Thief. Part of the problem may be that I haven’t read any of its predecessors, so picking the story up when it is so far advanced is likely to be difficult, but I also found the style twee and rather cloying. I read as much as I could take, but I gave up as I wasn’t enjoying it at all. I have given this three stars even though I didn’t like it becaus I’m afraid this wasn’t for me. I recognise that it’s a matter of taste and not that it’s a bad book, but I really couldn’t get on with The Strawberry Thief. So, I’ve been a huge fan of this author for decades and an avid Twitter follower. Having said that, I haven’t always liked all of her books but I like and respect her. I so wanted this book to be wonderful and was afraid I would be disappointed. How do you follow up with fourth “Chocolat” story without ending up with a kind of watered down magic? I think I was almost expecting to be disappointed. I wasn’t. I loved it. It’s filled with original magic and and peopled with a humanity that is soft an So, I’ve been a huge fan of this author for decades and an avid Twitter follower. Having said that, I haven’t always liked all of her books but I like and respect her. I so wanted this book to be wonderful and was afraid I would be disappointed. How do you follow up with fourth “Chocolat” story without ending up with a kind of watered down magic? I think I was almost expecting to be disappointed. We have returned to Lansquenet-sous-Tannes, where Vianne Rocher is continuing to practice her own brand of choc I read The Strawberry Thief as the wind danced away the last of March and the stirrings of April were warming my blood, speaking of endings and new beginnings. Magic was in the air and I swear it was coming from straight from the pages of my book. So suffused was I in Joanne Harris’s masterful piece of storytelling that I couldn’t bear to be parted from it for more than a minute or two. Chocolat by Joanne Harris is an incredibly well known story now. I've read it, many years ago, and I've also seen the film starring Juliette Binoche and Johnny Depp (I loved it, even if it wasn't exactly true to the book). The Strawberry Thief is book four in the Lansquenet-sous-Tannes books. I haven't read The Lollipop Shoes or Peaches for Monsieur Le Curé and it doesn't matter at all as, with my knowledge of the characters from Chocolat and the explanations in The Strawberry Thief, I managed p Chocolat by Joanne Harris is an incredibly well known story now. I've read it, many years ago, and I've also seen the film starring Juliette Binoche and Johnny Depp (I loved it, even if it wasn't exactly true to the book). The Strawberry Thief is book four in the Lansquenet-sous-Tannes books. I haven't read The Lollipop Shoes or Peaches for Monsieur Le Curé and it doesn't matter at all as, with my knowledge of the characters from Chocolat and the explanations in The Strawberry Thief, I managed perfectly well, although I'm now kicking myself for not reading the filling in the sandwich, so to speak. Anyway, on to The Strawberry Thief. Vianne Rocher is still running her chocolate shop and Reynaud is still the priest. But a couple of new characters take centre stage. Rosette is Vianne's younger daughter, now aged 16. She's considered a 'special child' as she can't really speak properly and is a bit of a free spirit. Vianne only wants to protect her and so keeps her close. The other new character is a shopkeeper who is almost blown in on the wind and this character brings about massive changes in Lansquenet-sous-Tannes whilst incurring Vianne's suspicions as to what her motives are. The thrust of the story is the death of Narcisse, the florist, and his reasons for leaving his woodland to Rosette along with what seems to be a kind of confession which he leaves for Reynaud. Narcisse's death is the catalyst for so much change and I thought the strands of the story were intricately and expertly weaved together by Harris . The Strawberry Thief is absolutely beautifully written. It has an ethereal quality, a magical feeling to it that is thoroughly captivating. It's not a book I could rush, in fact I kept having to put it down between chapters. It's quite intense and complex and I wanted to take every detail in, but that meant that I couldn't simply race through it, and nor did I want to. This book really is a complete and utter delight from start to finish. I loved my time in Lansquenet-sous-Tannes and the descriptions of the chocolates that Vianne creates in her shop. There is something so enchanting about the whole thing. The narrative ignites the senses, with the smells, the visual conjured up by the writing and the setting of the French village. You have to use your imagination, of course, but it's not difficult when the writing is so evocative. It’s magical, it’s beautifully written, it’s emotional, it’s dark, it’s heartbreaking…. I ADORED IT!! We re-visit Vianne and she is settled and still running her wonderful chocolate shop, with help from her daughter Rosette who is described as a ‘special child’ and who has made so many friends amongst the locals with her innocence and inquisitive nature. One of her friends is Narcisse, the florist, and when he sadly dies and leaves Rosette her a plot of land in his will things begin to change for It’s magical, it’s beautifully written, it’s emotional, it’s dark, it’s heartbreaking…. I ADORED IT!! We get to enjoy this story from a number of perspectives – Vianne, Rosette are the main narrators but we also hear the story of the local Priest who has also been left something by Narcisse which opens up a much darker side to the story and shows the impact of living life with regrets and secrets. The new arrival in the village also plays a big part in the relationship between Vianne and Rosette, as the curiousity of Rosette becomes too much for her to keep away despite her mum’s warnings. Rosette’s story is entrancing. She knows she is different from the other children but that doesn’t stop her following her heart and all she knows she has learnt from life and her experiences. She doesn’t speak but finds different ways to communicate her thoughts and fears and is such a gentle soul that you just warm to her immediately. Obviously her mother is very protective towards her and sees the prejudices of others who don’t understand her ways and often look down on her, so that makes her even more determined that life should remain as simple as possible for her sometimes that control just seems a little too smothering. My thanks to Orion Books for an eARC via NetGalley of Joanne Harris’ ‘The Strawberry Thief’ in exchange for an honest review. This is the fourth in her Chocolat series and I have read and loved all of them. Harris provides enough background for new readers though the series is such a delight that I would recommend all of them to anyone wishing to enter this rich world of magic and chocolate. 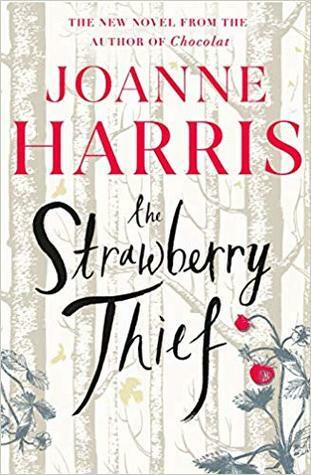 Following on a few years from the events in ‘Peaches for Monsieur le Curé, Vianne Rocher and her daughter, My thanks to Orion Books for an eARC via NetGalley of Joanne Harris’ ‘The Strawberry Thief’ in exchange for an honest review. Following on a few years from the events in ‘Peaches for Monsieur le Curé, Vianne Rocher and her daughter, Rosette, have settled down in Lansquenet-sous-Tannes. Vianne has reopened the chocolaterie and become part of the community that had once rejected her. The death of Narcisse, the florist, triggers change when he leaves a small woodland to Rosette and a confession addressed to Father Reynaud. His daughter and family are very upset with these bequests and seek to overturn them. In addition, a new mysterious shop opens in place of the florist’s and challenges Vianne’s sense of self and place in the village. I could go on and on but feel it best to not say too much so as not to spoil the experience for other readers. Harris is an accomplished storyteller and weaves together a number of storylines into the narrative. Themes such as guilt, relationships between parents and children, and manipulation are confidently explored. The symbolism is as always very rich. I fell in love with the little oak wood, which felt like a place outside time and the perfect setting for a dark faerie tale. I was surprised to find that I was feeling less empathy with Vianne given some quite subtle changes in her use of magic. This is also Rosette’s tale, who at fifteen is coming into her own magic. A number of chapters are hers and others are Reynaud’s as he reads Narcisse’s confession. I felt a little sad to reach the final pages though these characters and Lansquenet-sous-Tannes have a lasting place in my heart. It is a novel that I would happily reread. The cover art is subtle and exquisite and I have preordered the hardback to join my existing collection of the series. There is always something comforting about returning to somewhere you know so well, to characters, that over the years you have grown to love and cherish. When the author also happens to be Joanne Harris you knew you were in for a real treat and The Strawberry Thief did not disappoint. So, off I went to the sleepy French village of Lansquenet-Sous-Tannes and back into the lives of Vianne, Rossette, Roux and Reynaud. I could almost smell the luxurious aroma wafting from Vianne’s chocolatiere shop, There is always something comforting about returning to somewhere you know so well, to characters, that over the years you have grown to love and cherish. When the author also happens to be Joanne Harris you knew you were in for a real treat and The Strawberry Thief did not disappoint. So, off I went to the sleepy French village of Lansquenet-Sous-Tannes and back into the lives of Vianne, Rossette, Roux and Reynaud. I could almost smell the luxurious aroma wafting from Vianne’s chocolatiere shop, my tastebuds salivating at the thought of the taste of her wonderful chocolate creations. Yet you sensed there was something not quite right, a gentle undertone of disquiet, the possibility of change lingering in the air. Told in the alternating voices of Vianne, Rossette and Reynaud, Harris’s beautiful narrative captured the very heart of their emotions, their thoughts and their inner turmoil. For Vianne, it was what every mother dreads, as her children grow up and want to spread their wings, it was the realisation that we cannot hold them close, cannot clip their wings but must give them flight and send them on their way.. You knew from the beginning Vianne’s need to prevent Rossette from finding her own voice was wrong, but that Harris would take you on a journey, that you would witness Vianne’s struggles, even if that meant hurting those around her. Rossette, Vianne’s youngest daughter, was just the most wonderful character, unlike other children, her strange quips, her silence wonderfully endearing yet loaded with meaning. Harris brilliantly conveyed her feelings, her insights into the minds of those around her, that made your heart melt and want to reach out to her. She gave the feeling that she was special, unique, that bigger things were waiting for her yet you didn’t know what they would be and more than anything you wanted to discover what they were and where the story would take her. Reynaud, the Priest, hid a secret that tore him apart that weighed him down, that burden getting heavier as he carried around the deceased Narcisse’s final confession, and you sensed his trepidation as he slowly read his story, his fear as he prepared to turn the next page. Harris’s skilfully wove a mystery, a murder through the voices of her characters and what I liked was that although it was a big part of the novel it didn’t drown out the individual characters, but sat at their side, used as a tool for them to discover what they wanted, how they would resolve their own issues. One character I did love was Montane, the newcomer. I loved her colour, her insight and Harris’s ability to use her to spark rumour, unrest, and division amongst the the villages. The Strawberry Thief wasn’t about high drama and confrontations instead Harris used her narrative and characters to create gentle ripples that undulated throughout, that took the characters through the process and acceptance of change. This is a book you’ll read in one stand but it has some little pearls that will be part of you from now on. There are two ways to enjoy this book, to read it like a fiction book; with some fantasy and suspense or read it to help you grow as a person and as a parent. I am well aware that a book can change your perspective on it depending on your personal situation, maybe that’s why I liked so much this story, it tells some trues that are not always welcomed but they have to be said. The story happe This is a book you’ll read in one stand but it has some little pearls that will be part of you from now on. The story happens 5 years after the famous Chocolat; Vianne Rocher is starting to feel at home at Lanquestenet-sous-Tannes when the mysterious wind arrives to make changes to her life. A change doesn’t mean something bad, but maybe it will need an adaptation time to get used to the new situation. But Vianne has seen too many changes lately in her life to see them as something good… First, when Narciss, the florist, dies and leaves Vianne’s youngest daughter, Rosette, a forest. She doesn’t know that her life is starting to change, so when a mysterious shop opens in town she is ready to fight and to win, no matter what. The story is told between three characters; Vianne, how is trying to stop the changes in her life; Rosette who has always been different and she just wants to be like everyone else. And the last one, the priest, who is reading the last confession Narciss wrote before dying. There are so many things to talk about this book and to discuss with any reader that has loved the story… but I don’t want to make any spoilers, so simply trust me, this is an amazing read that I am sure you’ll love! If you enjoy a wonderful story written beautifully read on...Rosette is 15 and does not attend school. She rarely speaks but does communicate through sign language to whom she chooses. Her and her mother have lived in the village for around five years and Rosette has befriended an old man , Narcisse through going into his wood. Vianne runs the village chocolaterie and hence sees many of the villagers day to day as they pop in for a hot chocolate and sweets. When Narcisse dies Vianne is the execu If you enjoy a wonderful story written beautifully read on...Rosette is 15 and does not attend school. She rarely speaks but does communicate through sign language to whom she chooses. Her and her mother have lived in the village for around five years and Rosette has befriended an old man , Narcisse through going into his wood. Vianne runs the village chocolaterie and hence sees many of the villagers day to day as they pop in for a hot chocolate and sweets. When Narcisse dies Vianne is the executor of his will- much to her surprise, and he has left Rosette the woodland. His daughter who has only recently appeared is horrified and wants to contest his decision. Part of her reason is to look after her son. a child no one has heard of before now. Narcisse has also left a document to be read by Reynaud the village priest and no -one else. Reynaud soon discovers that Narcisse held a secret for most of his life. His old floristry shop has been relet by his daughter and the new occupant is rather a mystery to the villages. Art of a type they would rather not have around. Joanne is a wordsmith. Her descriptions are beautiful and this is one of those where you can immerse yourself in a another world and think of woodland, strawberries and chocolate- what’s not to like? Rosette is a likeable character and much smarter than many make her out ot be. Her champion is her mother who would never underestimate her. This is one beautiful and emotive read. I smiled, I shed a tear. One to remember. I am going to have to admit right at the beginning of this review that I have never actually read Chocolat so reading The Strawberry Thief was the first time I had been introduced to Joanne Harris’s work. Couple this with the fact that the style of authors writing is not one I would normally read, I did wonder if I would like it. I can honestly say that I am glad that I pushed myself to read something outside my normal comfort zone as I really loved it. 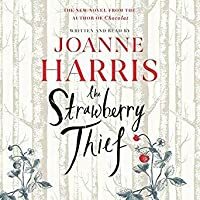 What seems like a charming story about Via I am going to have to admit right at the beginning of this review that I have never actually read Chocolat so reading The Strawberry Thief was the first time I had been introduced to Joanne Harris’s work. Couple this with the fact that the style of authors writing is not one I would normally read, I did wonder if I would like it. I can honestly say that I am glad that I pushed myself to read something outside my normal comfort zone as I really loved it. What seems like a charming story about Vianne Rocher and her daughter Rosette is actually so much more. Living in Lansquenet-sous-Tannes they seem to have a settled life with Vianne running an established Chocolate shop. Things change however when Rosette is left a plot of land when florist Narcisse dies. This does not sit well with his daughter who believes that the land should come to her so that she can sell it to developers. When the mysterious tattooist Morganne arrives, everyone starts to feel a little unsettled. The story is told from three different points of view, Vianne, Rosette and the priest Reynaud, each one of them looking at events in a different way. Where this can sometimes be distracting in a book, I think in this instance it really works. Although the book centres on these three main characters there is so much more going on. Secrets from the past slowly find their way back into the present and people are forced to confront their actions. What I think I loved most was witnessing the change in Rosette. She goes from a shy child that only seems to relate to her mother, to finding her own voice and talent. Vianne has tried desperately to hold onto Rosette but even she finally realises that she has to let her go and find her own way in the world. This is the fourth book in the series but don’t worry if like me you have not read any of the others as it is strong enough to stand on its own and at no time will you feel like you have missed an important piece in the story. Joanne Harris has created characters with enough depth that you can’t help but get invested in their journey of discovery about themselves and those around them. If you are going to pick up just one book that might not be your normal read, then The Strawberry Thief would be a good choice. Joanne Harris' beautiful prose has captured my imagination and Rosette Rocher has stolen my heart. The Strawberry Thief is my first introduction to the work of Joanne Harris, I haven't even watched the movie adaptation of Chocolat so I totally read The Strawberry Thief with fresh eyes. It is 20 years since the author published Chocolat and The Strawberry Thief is the fourth book in the series. The book can easily be read as a standalone and for brand new fans of Joanne Harris' work, like myself, Joanne Harris' beautiful prose has captured my imagination and Rosette Rocher has stolen my heart. 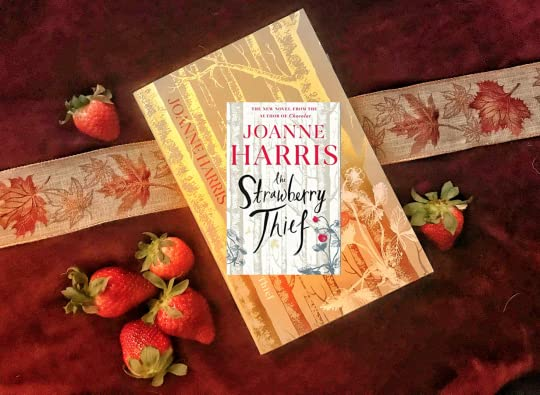 The Strawberry Thief is my first introduction to the work of Joanne Harris, I haven't even watched the movie adaptation of Chocolat so I totally read The Strawberry Thief with fresh eyes. It is 20 years since the author published Chocolat and The Strawberry Thief is the fourth book in the series. The book can easily be read as a standalone and for brand new fans of Joanne Harris' work, like myself, you will soon be swept away with the beauty of the storyline however, now I've had the privilege and pleasure of reading this novel I am very keen to read all the books in the Chocolat series so for established fans of this authors work you will be in for a treat revisiting Lansquenet-sous-Tannes. The Strawberry Thief is a story like no other but behind all the magic and mystery there is a very relatable story about a woman and her relationship with her children that are growing up and becoming independent. It's also a story of grief and of appreciating the true meaning of love. I found Joanne Harris' writing so very beautiful and I was totally spellbound by the magical words of wisdom. Joanne Harris has gained a new fan in me. Life was abandoned to read this, especially as I was treated to a surprise copy on it's release date... a knock at the door and normal activity ceased. The magical mystiscism is still there but also added in are some more regular human fears, failings and dreads. I feel that I have grown up with Vianne and she reminds me greatly of someone I treasured. There were a couple of bits rather close to home but that is the beauty of this exceptionally talented Author - she draws us all in as though she, like Vianne - can see into our very souls. Many questions are answered from the previous 3 Novels but many are left to be answered. I have wondered if this Novel is a love song to Joanne Harris own Daughter Annouska, who married last year and has definately grown up with them. With 20 years between the publication of Chocolat and The Strawberry Thief, Joanne Harris’ latest serving of the Vianne Rocher story, anticipation has been great for the fourth novel in this much-loved series. Readers of the first book – or even viewers of the film adaptation – will know that there is magic within these characters, but the story really does cast its own spell, too, transporting you to the small French town of Lansquenet-sous-Tannes with its threatening winds and unsettling secret With 20 years between the publication of Chocolat and The Strawberry Thief, Joanne Harris’ latest serving of the Vianne Rocher story, anticipation has been great for the fourth novel in this much-loved series. Readers of the first book – or even viewers of the film adaptation – will know that there is magic within these characters, but the story really does cast its own spell, too, transporting you to the small French town of Lansquenet-sous-Tannes with its threatening winds and unsettling secrets.